Jodi Miller, Carrie Brown and Ginger Kimmel from Tranquility Salon hand out candy. Spring (Librarian Melanie Green), Summer (music teacher Tracey Notestine), Fall (phys ed teacher Kristen Soos) and Winter (music teacher Pamela Thayer) with Father Time (computer teacher Wes Hall) and Mother Nature (art teacher Terry Nelson) creatively get into the season. 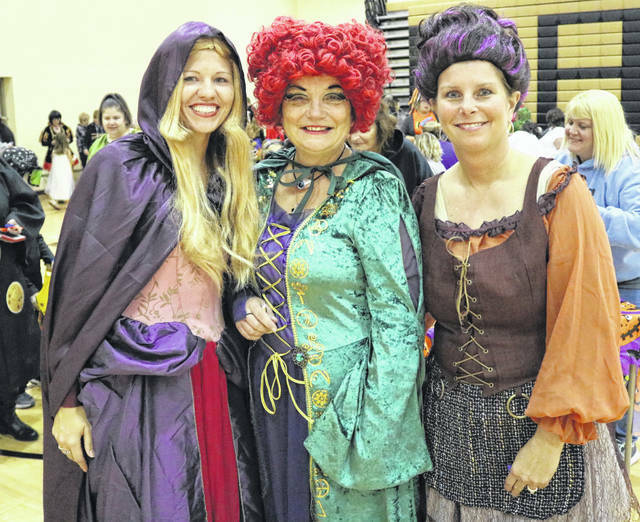 The Sanderson sisters from Hocus Pocus (Indian Lake Elementary aides Stacy Wisener, Terry Beck and Sherry Crockett) pose in their finery. 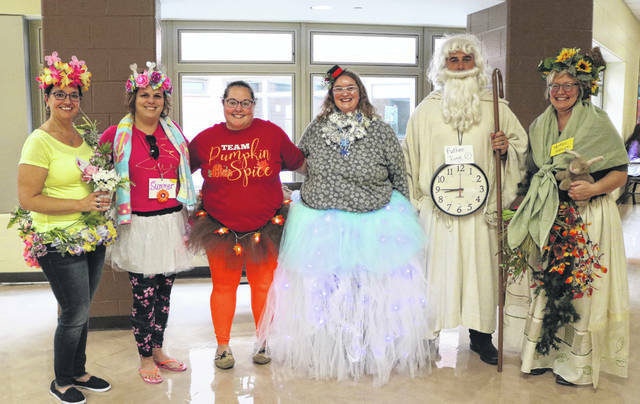 Hundreds of ghouls, superheroes and princesses snaked through the gym, hallways and classrooms at Indian Lake Elementary School on Oct. 25 ahead of Trick or Treat Night in Logan County. 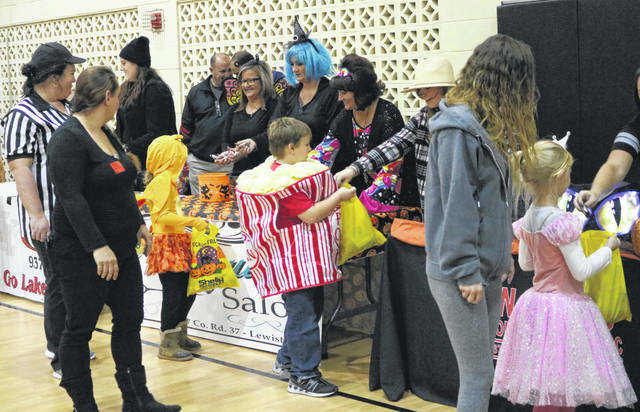 Nearly 60 businesses and organizations passed out goodies to students during the annual ILES Halloween Parade. Teacher Dan Young says when so many groups signed up to participate, they had to design a zig zag route through gym and cafeteria just to fit everyone. The Sanderson sisters from Hocus Pocus and the four seasons, Father Time and Mother Nature, even flew in for the fun! Students filed into the gym by grade levels and “trick or treated” past all the groups handing out candy. Then they returned to their classrooms for Halloween parties with snacks, games and crafts, led by parents.